Nothing signals the start of the holidays like the smell of peppermint, gingerbread baking in the oven or a real Christmas tree. I have no idea how to make gingerbread and I put up my tree way too early for a real one. When it comes to my favorite scents of the seasons, I rely on candles. 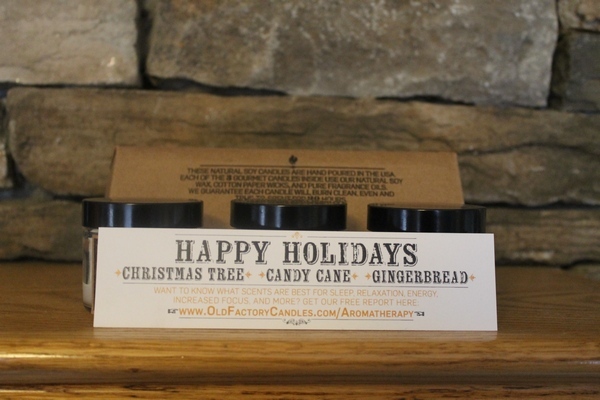 This year, I’m trying out Old Factory Candles Happy Holidays trio! They gave me my choice of gift set for review. While it was incredibly tough to choose, with the holidays starting in just weeks, I decided on that set. First I am pretty sure Old Factory a play on the “olfactory” sense. I think that’s such a clever name. Each candle is hand-poured using natural soy wax and burns for over 20 hours. The candles are actually guaranteed! That means if you don’t absolutely love the look and the scent, they’ll refund you your money. Of course, you’re going to love them! I am burning the Gingerbread as I type this. Right now, my house smells like a bakery, even though the closest thing I’ve done to baking today is throw a Pop-Tart in the toaster oven. The Candy Cane smells so invigorating. It’s one of my favorite scents to burn when I’m having a hard time staying awake. It’s also fantastic for clearing away brain fog. I only lit the Christmas Tree for a moment, just to test it out. I’m waiting until after Thanksgiving, when I put up my tree (if anyone can recommend a good fake tree, let me know. I need a new one!). We don’t usually get real trees because I’m scared of fires. Also because Cooper, my boy dog, has a tendency to “mark his territory” on them. Plus, I’m horrible at keeping any sort of plant alive. I do love the smell of a real tree though. The Old Factory Candles Christmas Tree candle definitely makes it smell just like Christmas in the house! If holiday cheer isn’t your thing (hey, there, Grinch, I’m looking at you! 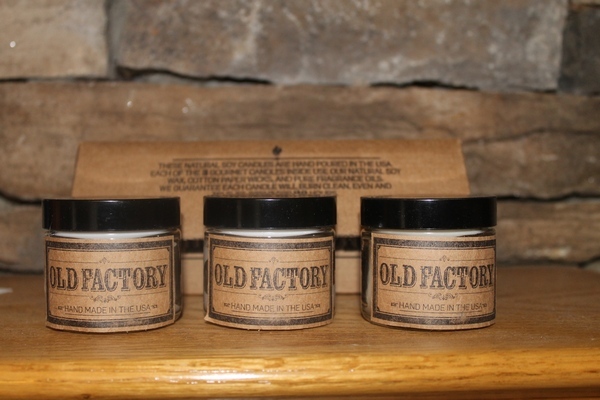 ), Old Factory Candle has tons of other great trios to choose from. I was “this” close to going with their Coffee Shop Gift Set. Planning a romantic evening in? How about a Romance gift set with Rose Petals, Champagne and Dark Chocolate? So many great sets to choose from! Remember, each set comes with three fabulous candles. Right now, you can only get them on Amazon. I believe the website is under construction, so I’ll keep an eye out and update you when it goes live. What is your favorite candle scent for the holiday season? Tell me in the comments! I have been hearing about these candles lately but have never used them before. I like that they use natural soy wax. At Christmas I have been liking the chocolate mint candle. Wonderful love new places to find great scents. Can’t wait to try these. I’m a candle nut.